News from Fingerhut group What exactly is Neo-Iconography? 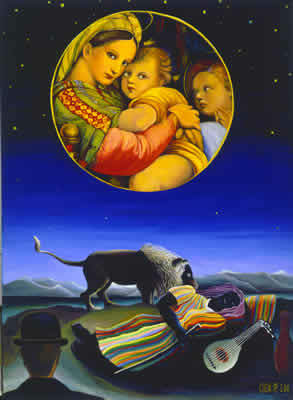 Lawrence Jeppson, the art critic and consultant for the Smithsonian Institution who coined this term said: “Neo-Iconography is a stunning paradox: an artistic symbolic resplendence that thrusts deeply into the esthetic future by appropriating every sort of image recognized from the past. This incandescent creator of Neo-Iconography, Dr. Tsing-fang Chen, relentlessly manipulates every variety of image from the public experience to create new realities, esthetic astonishments, and psychological/philosophical collisions!” So, Neo-Iconography is a synthesis of many ideas and images. At the heart of this style is Dr. Chen’s perception of the future of world culture: the “Five-Dimensional Universal Culture,” which he formulated into a kind of cultural theory in 1969, getting revelation from the American astronauts’ landing on the Moon. 4 Silkscreen published by Finger Hut Group… Dr. T. F. Chen: “Painting Irises (II),” 1993 screen print, 30x40.” Taken from 1992 o/c. In the late 1980s, the van Gogh painting “Irises” was purchased at auction for the astronomical, record-breaking sum of $80 million. This was a historical event in the art market. Yet how could this come to pass? As Dr. Chen’s image reveals, the painting is unfinished! Van Gogh, dressed as an artist from Holland, is seated in a sunny Arles garden, still adding dazzling, pure strokes of color to the canvas. We do not see his face, hinting perhaps that the nature of the artist is less significant than the nature of the art. Indeed, the greatest artist of all is obscured from human vision, but with a divine hand, continues to add strokes of color to the canvas known as Earth. Dr. T. F. Chen: “Love Above Confrontation,” 1993 screen print, 30x40.” Taken from 1984 a/c. A span of four centuries of changing values in artistic tradition electrifies the air between Titian’s “Venus with a Mirror” and Picasso’s “Seated Woman.” The contemporary viewer can see the beauty in both icons, but within their worlds, each woman argues for the authenticity of the stylistic expression of her image. Locked in a moment of confrontation, the two do not comprehend that another world exists that values and cherishes both for their differences, not in spite of them. Through an open window, Chagall’s folkloric pair of lovers float high above the fray. They seem to advocate “love above confrontation,” and are enjoying the freedom that only love can offer. Dr. T. F. Chen: “Happy Mme. Moitessier,” 1993 screen print, 40x30.” Taken from 1992 o/c. 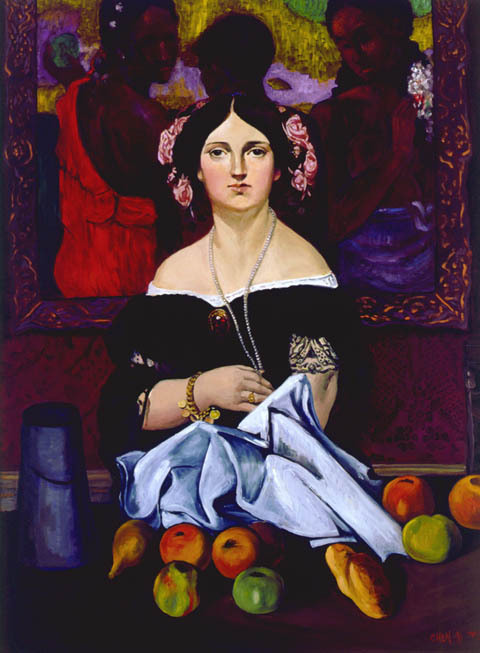 Between Cezanne’s still life and Gauguin’s Tahitian painting, Ingres’ “Mme. Moitessier” stands confident and serene. Her source of happiness is twofold: her portrait hangs in a museum, enchanting thousands; and she owns, within this frame of reference, two postimpressionist masterpieces. In linear time, this would be impossible, since both works were produced almost half a century after her death. But the imagination does not recognize the boundaries of time and space. This intriguing arrangement playfully revises history and demonstrates the depth of possibility in the postmodernist art world. Ingres: “Mme. Moitessier,” 1851, National Gallery of Art, Washington, D.C.
French painter Ingres was one of the artists who represented the height of the Neoclassical style of the Napoleonic period. He was renowned as a portraitist, and this is one of his finest works. The treatment of dessin, a French term indicating the representation of elements such as volume, light and shadow to give the appearance of three dimensions in a two-dimensional medium, was significant to the style. The Moitessiers were friends of Ingres—he knew the whole family—and were patrons as well. 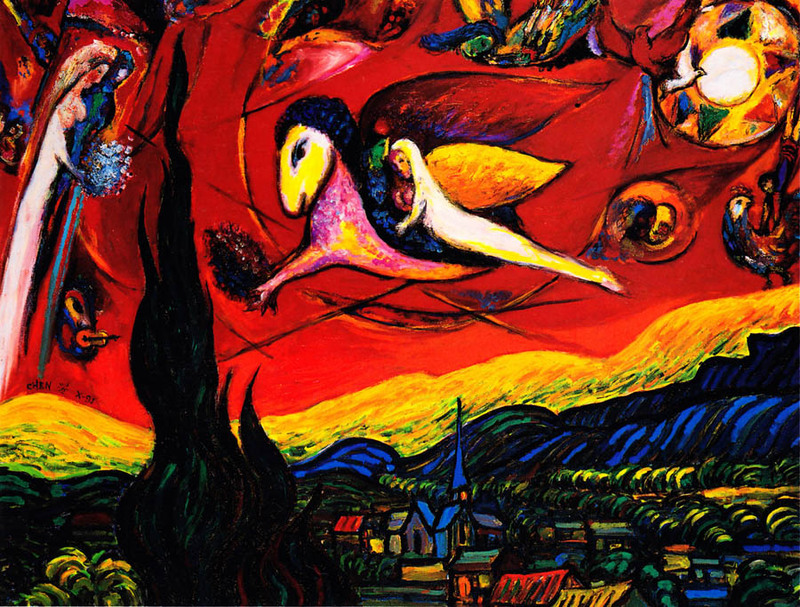 Wedding Above the Village / 77 X 101 cm / Print / 1991 The juxtaposition of complementary colors “the Chagall sky with the van Gogh landscape” excites the eye. When van Gogh painted Starry Night, he was lonely and unhappy, a victim of unrequited love who, more than anything, wished for a wife and family. Chagall’s exuberant Song of Songs images present a wish fulfillment: love, mutual bless, and evelasting joy. Although it was impossible on the physical plane to grant van Gogh a portion of happiness, through the merging of his work wih the transcendent sweetness of Chagall’s, Chen bestows a subconscious blessing. In a time out of time, and a place out of place, van Gogh can enjoy love and peace. 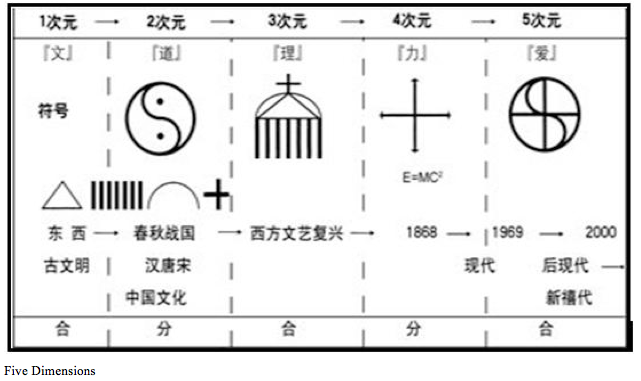 So, Neo-Iconography is a synthesis of many ideas and images. At the heart of this style is Dr. Chen’s perception of the future of world culture: the “Five-Dimensional Universal Culture,” which he formulated into a kind of cultural theory in 1969, getting revelation from the American astronauts’ landing on the Moon. 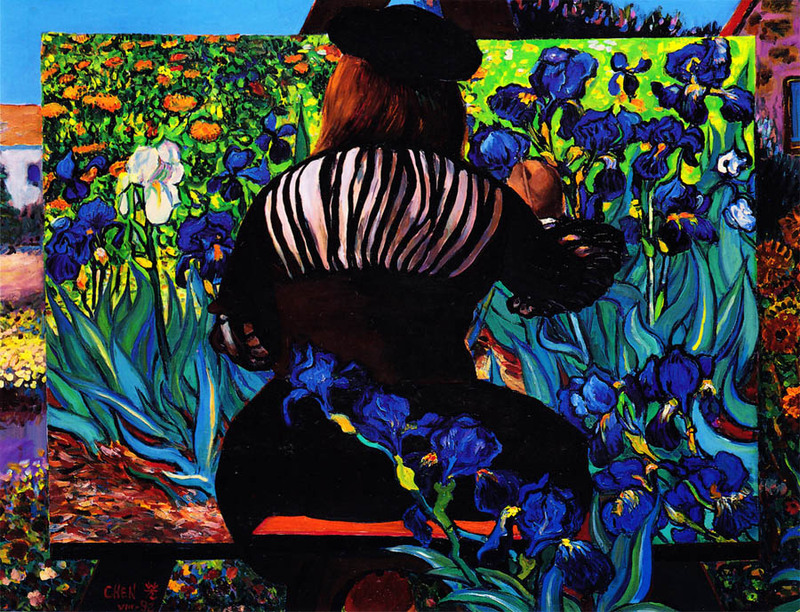 Dr. T. F. Chen: “Painting Irises (II),” 1993 screen print, 30×40.” Taken from 1992 o/c. In the late 1980s, the van Gogh painting “Irises” was purchased at auction for the astronomical, record-breaking sum of $80 million. 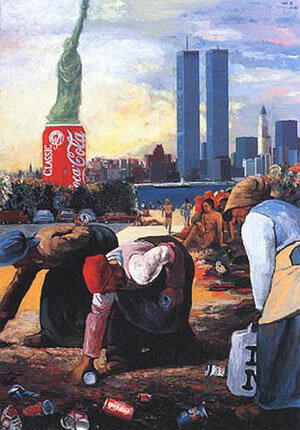 This was a historical event in the art market. Yet how could this come to pass? As Dr. Chen’s image reveals, the painting is unfinished! Van Gogh, dressed as an artist from Holland, is seated in a sunny Arles garden, still adding dazzling, pure strokes of color to the canvas. We do not see his face, hinting perhaps that the nature of the artist is less significant than the nature of the art. Indeed, the greatest artist of all is obscured from human vision, but with a divine hand, continues to add strokes of color to the canvas known as Earth. Dr. T. F. Chen: “Love Above Confrontation,” 1993 screen print, 30×40.” Taken from 1984 a/c. 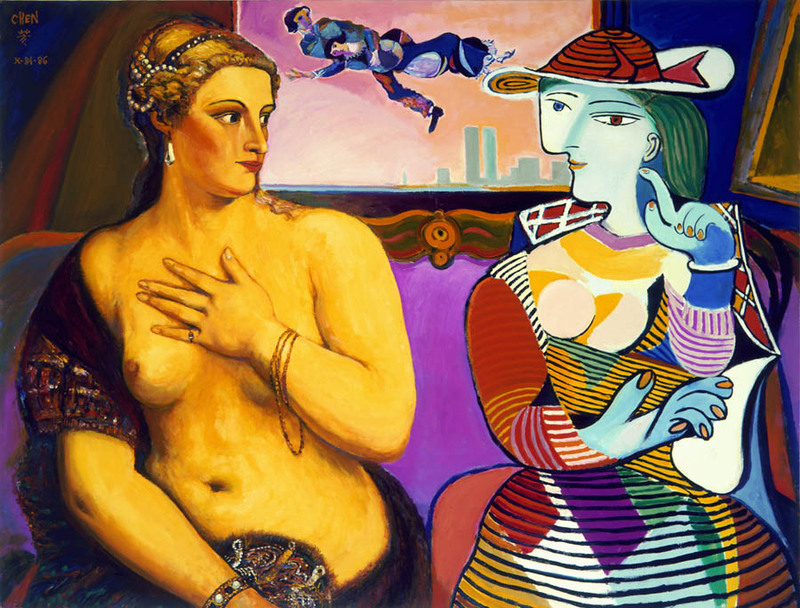 A span of four centuries of changing values in artistic tradition electrifies the air between Titian’s “Venus with a Mirror” and Picasso’s “Seated Woman.” The contemporary viewer can see the beauty in both icons, but within their worlds, each woman argues for the authenticity of the stylistic expression of her image. Locked in a moment of confrontation, the two do not comprehend that another world exists that values and cherishes both for their differences, not in spite of them. Through an open window, Chagall’s folkloric pair of lovers float high above the fray. They seem to advocate “love above confrontation,” and are enjoying the freedom that only love can offer. Dr. T. F. Chen: “Happy Mme. 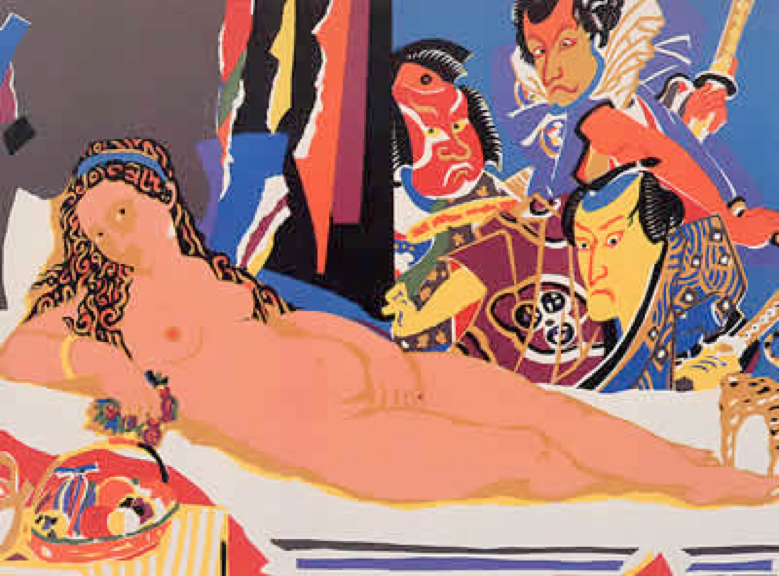 Moitessier,” 1993 screen print, 40×30.” Taken from 1992 o/c. Between Cezanne’s still life and Gauguin’s Tahitian painting, Ingres’ “Mme. Moitessier” stands confident and serene. Her source of happiness is twofold: her portrait hangs in a museum, enchanting thousands; and she owns, within this frame of reference, two postimpressionist masterpieces. In linear time, this would be impossible, since both works were produced almost half a century after her death. But the imagination does not recognize the boundaries of time and space. This intriguing arrangement playfully revises history and demonstrates the depth of possibility in the postmodernist art world. The juxtaposition of complementary colors “the Chagall sky with the van Gogh landscape” excites the eye. When van Gogh painted Starry Night, he was lonely and unhappy, a victim of unrequited love who, more than anything, wished for a wife and family.